The organic approach of the Petit Palais d’Aglaé extends into its bathrooms. Without Lauryl Etger sodium sulfate. Without DEA or harmful synthetics. These are products that have required months of laboratory research and testing and meet the “ECOCERT” and “COSMOS” standards. 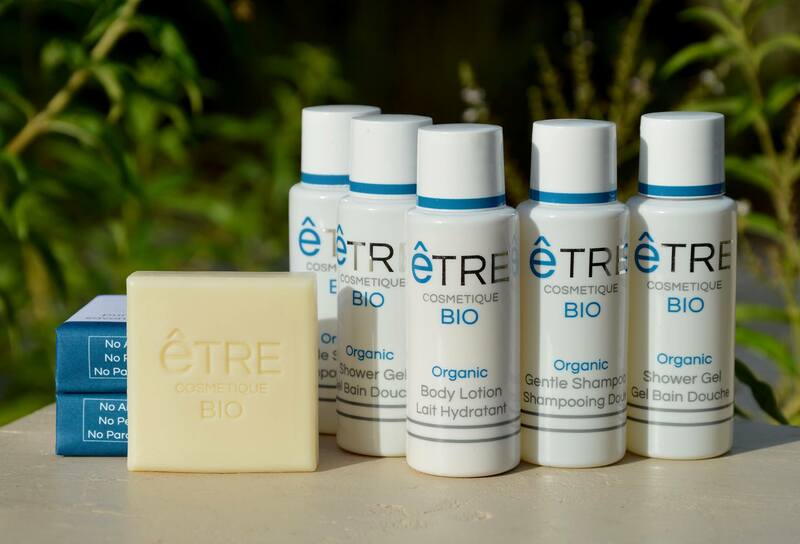 The “ETRE Cosmétique BIO” collection was named one of the best innovations in EquipHotel in 2016 and win the “Laurier ECORISMO” award for eco-responsible innovations. Organic products with the perfume of Verbena created by Olivier DECOSTER which he describes as a reminiscence of freshly picked verbena leaves in the heart of Provence for an intense moment of pleasure. Olivier DECOSTER is part of the restricted circle of the great European perfumers. It is now widely recognized for its creations of exclusive perfumes and fragrances for major fashion brands, interior decoration and hotels in the world. Formed in Grasse, the birthplace of French perfumery, by two renowned masters perfumers, Olivier DECOSTER made a hundred fragrances for the cosmetics industry before being solicited for the creation of high-end perfumes. He also created indoor perfumes and scented candles for several decoration houses. In 2009, Olivier DECOSTER created HD FRAGRANCES and put his talent and years of experience to the benefit of creating olfactory signatures for hotels and luxury cruises. It offers these establishments a welcoming, positive and refined olfactory identity.